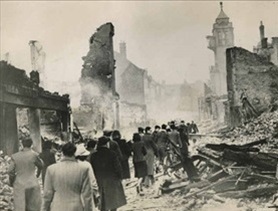 On this date in 1940 the first firestorm of the war was inflicted on Coven­try, Eng­land, a city of almost 240,000 people, during the Ger­man Blitz against that coun­try. Ger­man “path­finder” bombers flying along radio-direction beams tar­geted the medi­e­val cathe­dral city and indus­trial-muni­tions cen­ter in the English Mid­lands. Nearly 450 bombers rained more than 500 tons of high-explo­sive bombs and some 56 tons of incen­diary bombs (that is, 30,000 incendiary bombs!) over ten hours on a moon-bright night. The raging in­fer­no, spreading quickly due to the exis­tence of so many of Coven­try’s an­cient and closely built timber-framed buildings, destroyed or damaged 80 per­cent of the city cen­ter, including its cathe­dral, and about three-quarters of the city’s factories. Apart from the cathe­dral and city fac­tories, two hos­pi­tals, two churches, hotels, clubs, movie houses, pub­lic shel­ters, pub­lic swim­ming pools, a police sta­tion, and a post office were also bomb targets. Killed were 568 civil­ians who were laid to rest in two mass burials spread over a two-week period (it took that long to recover all the bodies); over 1,200 people were badly wounded. Berlin was giddy over its fire­bombing suc­cess. 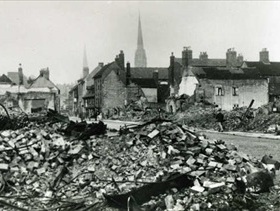 The official Ger­man news agency crowed that the raid on Coventry, codenamed Opera­tion Midnight Sonata, was “the most severe in the whole history of the war.” Germans created a new word for the type of destruc­tion they inflicted on the city, koven­trieren (Coventrate). Yet the English Mid­lands city quickly recovered from its ordeal, and within days most of Coventry’s factories were up and running. It became a point of pride, an in­di­ca­tion of the national mood, that morale recovered so quickly as well. Small signs sprouted in broken shop windows, announcing “Busi­ness as usual.” By Christ­mas 1940 the fire­bombing raids covered most of Britain’s major cities: Glas­gow in Scot­land, Bel­fast in North­ern Ire­land, the port of Liver­pool, and Shef­field deep in the heart of Eng­land were all badly hit. Just before New Year’s 1940, 130 bombers attacked Lon­don, nearly setting St. Paul’s Cathe­dral ablaze, but the surrounding areas of ancient buildings and churches repre­senting hundreds of years of history were lost. As the Euro­pean and Pacific theaters showed right up through August 1945, com­bat­ant popu­la­tions had a tre­men­dous abil­ity to suf­fer vio­lence and bleak futures without losing their will to sustain the war effort. Only the atomic bombings of Hiroshima and Nagasaki in Japan changed their leaders’ minds. 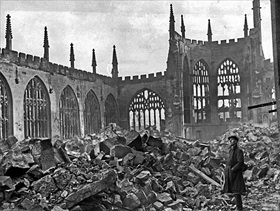 Left: Broadgate in Coventry city center on Novem­ber 16, 1940, following the 10‑hour Coventry Blitz during the night of Novem­ber 14/15. The burnt-out shell of the Owen depart­ment store (middle), opened in 1937, overlooks a scene of devastation. 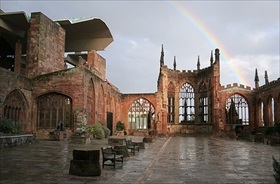 Right: The provost of Coventry Cathedral, also known as St. Michael’s Cathe­dral, and a party of helpers attempted to deal with the first set of incen­diary bombs that burst through the cathe­dral roof and walls by smothering the flames with sand. But another shower of incen­di­aries accom­panied by high explo­sives, oil bombs, and land mines forced the party to give up its efforts. By the next morning only the skeleton of the cathedral was left standing. 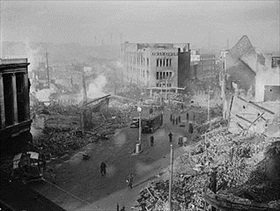 Left: This was an official U.S. press photo­graph, showing the rest of the world what the Luft­waffe had done to Coven­try—in this scene, Earl Street as seen from Jordan Well. The stream of peo­ple attempting to go to work the next day, picking their way through the rubble, highlighted per­fectly the point that the world’s press wanted to make, namely, the Ger­mans could not bomb the Brit­ish into sub­mis­sion. The Council House clock tower is clearly visible through the haze of smoke, and although the building had vir­tually all its win­dows blown in by bomb blasts, it sur­vived the night of November 14/15 remarkably unscathed. Right: Very little remained of Little Park Street by Novem­ber 15 after the houses and small fac­tories in that street formed one con­tin­uous raging in­ferno. This photo, taken some weeks after the raid, shows Holy Trinity Church spire (right in background), which was previously undetectable through the haze of smoke. 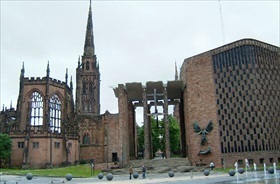 Above: The ruins of the old Coventry Cathe­dral, the most visi­ble modern-day reminder of the Blitz. A new cathe­dral was con­structed along­side the ruins in the 1950s, designed by the Scot­tish archi­tect Basil Spence. Later knighted for this work, Spence insisted that in­stead of rebuilding the old Angli­can cathe­dral it should be kept in ruins as a garden of remem­brance and that the new cathe­dral should be built along­side—the two buildings together effec­tively forming one church. The cathe­dral was recon­secrated on May 25, 1962.